Dermarolling / Microneedling / How hard to push? No, you do not have to push the needles in fully. The needles of a 1.5 mm dermaroller penetrate at most approx. 1.3 mm into the skin. You should apply mild pressure on the dermaroller. Push it down, but not too hard. Some skin is really hard to penetrate, such as the on the buttocks (here you can apply greater pressure). Facial skin is softer. You should soften your skin with a hot bath prior dermarolling. The skin is not very thick. A 0.5 mm dermaroller penetrates about 0.2 - 0.3 mm into the skin and that will already reach the top of the dermis in most skin areas. If you penetrate the skin by 1 mm, that is already very deep. The more needles a dermaroller has per square centimeter the harder it is to get the needles in and to get them deep (the more pressure is required). A single needle will penetrate really deep. The "one-liner" dermaroller that we sell specifically for stretch marks and scars will penetrate easily. A regular long-needled dermaroller will reach the stretch marks as well. Not all skin conditions warrant long needles. Scars and stretch marks do. Your skin is oversensitive at the moment. Don't apply anything. Plenty of men don't use any creams. When you go outside and it is sunny, wear a hat and try to stay in shady places if possible. Do not use soaps on your face for a while. Just water - not too hot. Gently wash your face with cold or luke warm Green Tea (keep it in the fridge and make fresh stock frequently). Don't use cotton pads to wash your face, only your hands. Hopefully your skin will calm down. Try to ignore your skin for a while. The less you focus on it the better. I don't know exactly how long the skin will be more sun sensitive after using A-Ret but as long as you apply it, you should not intentionally sunbathe. You should not "sunbathe" regardless - it is very bad for the skin. It destroys collagen. Stretch marks already have damaged collagen. Going outside and staying outside is OK with a sunscreen but do not intentionally bake in the sun. Naturally aquired vit. D is very important however, so walk the middle road. Don't bake in the sun but do get some of it occasionally to build up your reserves of vit. D.
To be honest, I do not understand why it is such a big deal for you. Stretch marks won't ever appear on the face so you just wear some light clothes and you can be outside all day, even when it's sunny. When you go swimming, take your clothes off and when you are done swimming, put them on again. I don't understand why do you insist on sunbathing so desperately mere days after dermarolling. It's a very bad idea. Yes, Hydrochinon is just a different name for the same substance (Hydroquinone) . Hydrochinon = Hydroquinone. Hydroquinone is banned in some European countries or it is prescription-only. I think the main problem is that people overuse it. They use high concentrations for a very long time. In the US, 2 % hydroquinone is OTC. Rolling scarred or non-scarred skin cannot cause such overproduction of collagen that it would form bumps. I have heard that one of our customers got bumps when he forgot rinsing the dermaroller after soaking it in dishwashing liquid. But his bumps were smaller than yours. Did you get them immediately after dermarolling? Are they getting better? The skin gets rougher after dermarolling for several days (the skin is renewing) but what you describe is not a normal reaction after dermarolling. At the moment I do not have any idea what can it be. I will think about it. More info would be helpful. Yes, use the single needle in combination with a dermastamp. Basically, dermarolling and needling are novel procedures and nobody knows absolutely the best/ideal routine for individual skin conditions so a little improvisation from customers is welcome. Not to mention that not everybody reacts the same to dermarolling/needling so giving the best general instructions for everybody is really difficult. Infadolan and copper peptides have different functions. Infadolan is mainly for the protection of the skin right after dermarolling, for keeping it moisturized and to create good conditions for skin regeneration. You can apply copper peptides after dermarolling and when it has been absorbed, apply a very small amount of Infadolan on top of it. If you choose not to use Infadolan, that is also OK. Concerning releasing the tethering, well if you are very careful, you can try it. Subcision needles are much thicker and longer than our single needles and they cut the fibers more efficiently but they also cause quite major skin trauma and can cause skin nodules. The subcision needle has sharp edges and the surgeon moves them repetitively back and forth. I still haven't had time to think about the best tool to perform the suction for home treatments. Maybe our customers can offer suggestions? Dermarolling is not recommended with serious cases of Rosacea because there is chronic inflammation involved in Rosacea and since dermarolling with long needles causes inflammation lasting up to several hours, it could potentially worsen Rosacea, just like excessive heat, cold, strong wind, acid peels, sun or any other source of potential skin irritation. However this is highly individual and what worsens Rosacea in one person doesn't worsen it in all Rosacea sufferers. Dermarolling the scars three times is not enough to obtain satisfactory results. You should certainly continue using your dermaroller. Single-needling is the most intensive scar treatment. You should continue dermarolling and definitely give the single needles a try but do a test patch on one scar first. If your scars are getting wider in deeper layers, needling will uncover those deeper layers and make the scar look temporarily bigger. As you continue needling, it should slowly fill up. A-Ret is very effective but unfortunately it makes the skin more sun sensitive so you should use a sunscreen. avoid the sun as much as you can. If you roll on your body, then simply wear some clothes and you can go outside even shortly after dermarolling but keep your clothes on..
Red stretch marks have erythrema - increased blood flow due to dilated blood vessels. It means they are still active. For the time being, you should use A-Ret gel on them because Tretinoin improves fresh stretch marks. It will make them temporarily even redder but that will subside. Do not use Tretinoin if you are pregnant. Wait with dermarolling. Your stretchmarks are so fresh that they might get significantly smaller or they might not even become stretch marks. Yes, excessive cleansing of the skin with soap dries it out. It strips it off its natural oils. In fact, water also dries out the skin, especially long, hot bath. Actually, you have been exfoliating because shaving is one of the most efficient exfoliating methods. I have never used Emu oil but I have been cleaning my face with almond oil, sprinkled on a wet cotton pad, and it makes my skin very nice and supple. Our body does re-direct resources but in a different way than you suggested. If our body for example lacks vit. C for some vital processes, it takes it from the areas where it is not so vitally needed, such as the skin. Calcium can for example be taken from our bones and used elsewhere, if direly needed (such as to establish cardiac electolytic balance). I think you should just give your skin some time to get back to normal. If it doesn't get better in a couple of months, try a dermaroller. Hopefully, the most stressful period of your life lies in the past. You are lucky! It is hard to get rid of Melasma. The cause of Melasma is not fully understood and that is why they cannot treat the cause, they only treat the symptoms. Since inflammation seems to be a factor in Melasma, anything that can cause skin inflammation or irritation has to be used with caution. Acid peels often help suppress Melasma but in certain individuals it makes Melasma worse. The same goes for Tretinoin and the same for laser treatments etc. In many cases it helped, in some cases it made it worse. That is why I am cautious recommending dermarollers for Melasma without warning that a test patch is absolutely necessary. Dermarolling causes a short lasting inflammation. The inflammation after dermarolling with short needles subsides much quicker or there is no inflammation at all and that is why it is safer in case of Melasma. You can use longer needles but whatever length you use, do a test patch first. Do not roll very frequently - give your skin time to regenerate. sunscreen - also in winter or on cloudy days. UVA ( they penetrate to the dermis) levels are high year-round and it is not blocked by window panes. UVB is highest in summer. Try to avoid extreme temperatures (very hot or cold). Do not rub your skin, do not go to the sauna etc. At the beginning, use very diluted vit. C to see how your skin reacts. Vit. C was successfully used in medical studies to improve Melasma but again, it could in some individuals irritate the skin and you have to be careful. Apply it in the evening because vit. C is sensitive to light. I am not sure if combining it with dermarolling is a good idea in your case. It is a good idea when you have no Melasma or if you have stubborn dermal Melasma (to bring the vit. C or other lightening products to the dermis) but since your Melamsa has disappeared, you should probably not risk any potential skin irritation from dermarolling (certainly not without testing it on a small skin area). Apply diluted vit. C to help keeping your Melasma away. Vit. C, just like most lightening agents, can't affect the existing pigment much, it can only reduce the formation of new pigment. That is why it sometimes takes months to see effects. Inflammation is our body's response to conditions when the area has to be cleared of bacteria, virii, fungi, damaged cells due to injury, sunburn, etc. The area temporarily gets red (increased blood flow), warm and tender/painful. The body initiates processes to remove unwanted elements from the area, remove debris (damaged skin cells etc.) and trigger new cell growth. This is a normal, necessary reaction which purpose is to heal and renew the tissue. It only becomes a problem when the inflammation becomes chronic. The cause of chronic inflammation is not fully understood. The prevailing opinion is that it is a result of our immune system attacking our own healthy cells. Others claim that there must be a causative agent (such as bacteria, virii or something we still don’t know about) that causes our immune system constantly attacking it. It is a very complicated subject. Whether the increased number of blood vessels has an effect on the overproduction of Melanin pigment in Melasma is unknown. Melanin is normally present in our skin and makes up our skin tone but in Melasma, Melanin is overproduced in certain areas (Melasma's brown spots are caused by the over production of Melanin). Melanin is induced by sun exposure as a form of natural sun protection (Melanin absorbs harmful UV and transforms it into harmless heat). Unfortunately, Melanin production can also be triggered in some individuals as a result of skin irritation, inflammation, acne, injury (even a minor one such as bug bite), exposure to high temperatures etc. It doesn't mean that anybody with "ordinary" hyperpigmentation has Melasma. Melasma, just like stretch marks, seems to be tightly connected to hormonal causes. Melasma often appears in pregnancy or in women on hormonal contraception or hormonal replacement. It only means that people with Melasma have to be careful with everything that could potentially trigger Melanin production. Some of the procedures that help Melasma can also potentially trigger melanin in susceptive individuals. Another problem with Melasma is that in can occur in the epidermis - then you are lucky and you can significantly improve it for example with acid peels. Or it also affects the dermis, which is the deeper skin layer. Dermal Melasma is simply too deep to be removed. Normally, there is no melanin in the dermis. It was found that the basal membrane (the membrane between the epidermis and the dermis) is damaged in dermal Melasma sufferers and that facilitates the migration of melanocytes and Melanin into the dermis where they constantly cause hyperpigmentation. - Mechanical removal of Melasma by dermabrasion, acid peels, ablative lasers etc. This removes or partially removes the existing pigment but does not prevent the overproduction of new pigment. That is why it has a high reoccurrence rate. Moreover, it can irritate the skin, cause inflammation and in case of ablative lasers, it heats up the skin. This can potentially make the condition worse. - Non-ablative lasers or IPL - the light from the laser or Intense Pulse Light is absorbed by concentrated Melanin in the skin or by Hemoglobin in the blood, that heats it up and the pigmented cells or enlarged blood vessels get destroyed. High re-occurrence and it can potentially make it worse. Currently, the most successful Melasma treatment products are those that reduce Melanin production (skin lightening products) such as Hydroquinone (Hydrochinon) , Arbutin, Kojic acid or vit. C, often in combination with products that speed up the skin's turnover and even out skin tones, such as Tretinoin (Retinoic Acid) and sometimes in combination with anti-inflammatory such as corticosteroids, vit. C, Tea Tree oil etc. Each of these products has its pros and cons. The reason why Melasma is so difficult to control is because when you manage to remove it mechanically, it frequently re-appears. When you stop using Melanin inhibitors, it can reappear. It commonly requires life long maintenance. Nevertheless, it sometimes emerges in pregnancy or when on hormonal contraception and it completely disappears when the hormonal influence is no longer present. In some cases the Melasma persists. What you describe is a strange phenomenon.. Pores get larger as we age but such quick deterioration of the skin should normally never occur. Are you sure there is no underlying health problem? Concerning the skin or otherwise? 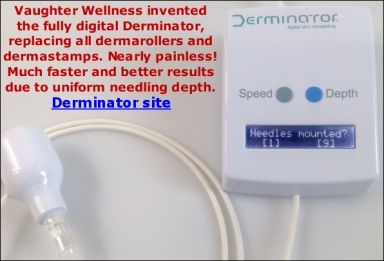 A dermaroller improves cosmetic issues (wrinkles, scars, pigmentations, stretch marks) but it cannot improve skin diseases such as psoriases, lupus, Rosacea, fungal infections , eczema etc. A dermaroller should not be used on the skin that has skin diseases. To be honest, I think you should see a dermatologist before you start using a dermaroller to make sure that your skin is just aging and not suffering from something more serious. You certainly should not be getting suddenly scars out of nothing. That is really weird. Unfortunately I am by no means a dermatologist, neither can a dermatologist diagnose you without seeing you. Certain secretagogues could stimulate the production of growth hormone, which may benefit the skin. I'd have to read how much the currently available "natural secretagogues" actually work, and in how far this will benefit skin, if at all.